I picked up a Star DE 3 pc a few days back(my first 3 pc).Rather pretty 95%+ intact ,gold plating a little thin on the top cap center. Light weight,handle is nicely checked,stays secure in wet hands.The performance is nice,mild.I think in 5 shaves I have had 1 tiny nick when I hurried.Others have opined the Star DE is a bit more aggressive than the equivalent Gillette Tech razor.I have a Tech on the way and will have to do a comparison. With this razor I think you would have to work at it to cut yourself.By the same token I think you would have to work to get a BBS shave.I've had some DFS with the razor,almost BBS.But I find myself reaching for it more often than my other DE razors. I think I paid 5$ for this razor,Stars do not command the prices that Gillettes do.But they shave damn good.If you don't have one pick one up. Is it a Chinese razor? Never seen one myself.Thanks for the info. I sold a Star razor recently. They were made in England by Ever Ready I believe. The Star was an ASR (Ever Ready) and before that it was a company that was acquired. 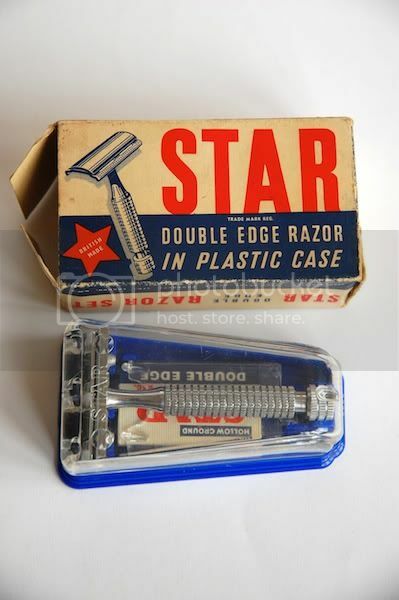 Star was an SE maker in the early 1900s and the name was later placed on this razor originally as Silver Star. Here are mine and the nickel one was sold under the Personna name in England as well. It (nickel) was sold under the Star name in the U.S. and is the rare on this side of the Atlantic. The gold tone units are plentiful in the U.S. The middle one is a modified gold tone unit with a custom molybdenum coating. It is as mild as a Tech with a far better handle. I prefer this over a Gillette Tech. Here's the one I had, complete with case. The case has a very nice flip up blade holder under the razor. Well, let me put it this way, it's the only DE I've actually kept! Great for a day when my skin is a bit sensitive. These are fantastic razors. I'd love to find a non gold model. For the most part I use single edge razors, but the Star DE is a very good razor and every bit as good as everyone has stated. I recently sold a similar gold Star. I like the look of the silver variant, the handle screams ER Streamline. I'm impressed enough with it that if it were in poor shape plating-wise I'd see if my local jeweler could replate it. Since I mentioned plating-GDCarrington that moly coated is nice looking.Did you do it yourself or have it done?Is the coating slick or grabby? As an earlier poster stated Star was an early competitor to Gem in the SE market.I think they later became a subsidiary or sister company of Gem. I'm not sure at what point they started producing DE models.But they are good razors.Damn,now I'll have to get one of their SE's to compare it to my GEM's.ARRRRGGHHH.I think I may be getting a case of RAD. (08-19-2012, 07:28 AM)urrlord Wrote: I'm impressed enough with it that if it were in poor shape plating-wise I'd see if my local jeweler could replate it. As for the coating, a hobbyist at another forum did that for me. He is no longer doing that coating work due to other commitments on his time. The coating is slick and hard. The Weber diamond coating has a hardness of 1.0 and this coating has a hardness of 0.9. It is extremely hard and slick.